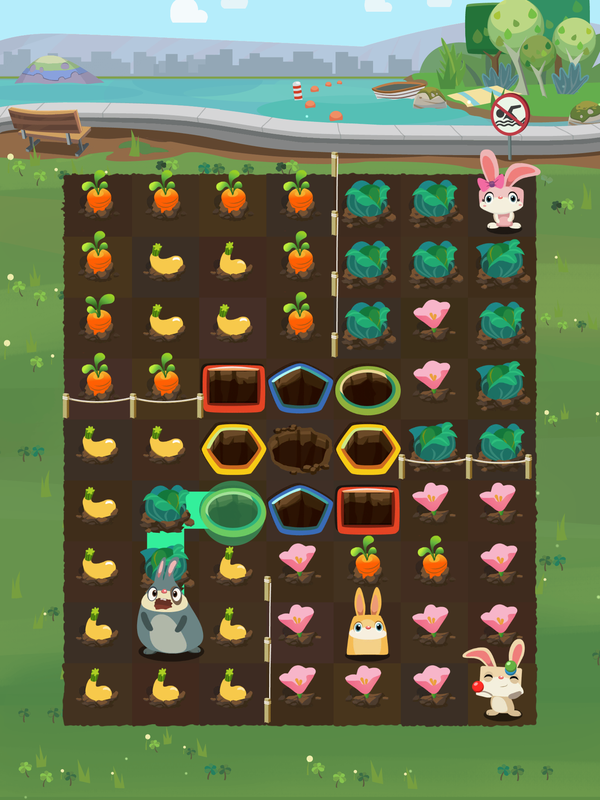 Patchmania is a delightful new puzzle game for iOS that features 925 addictive original puzzles, fun path drawing controls, and super cute animated bunnies! 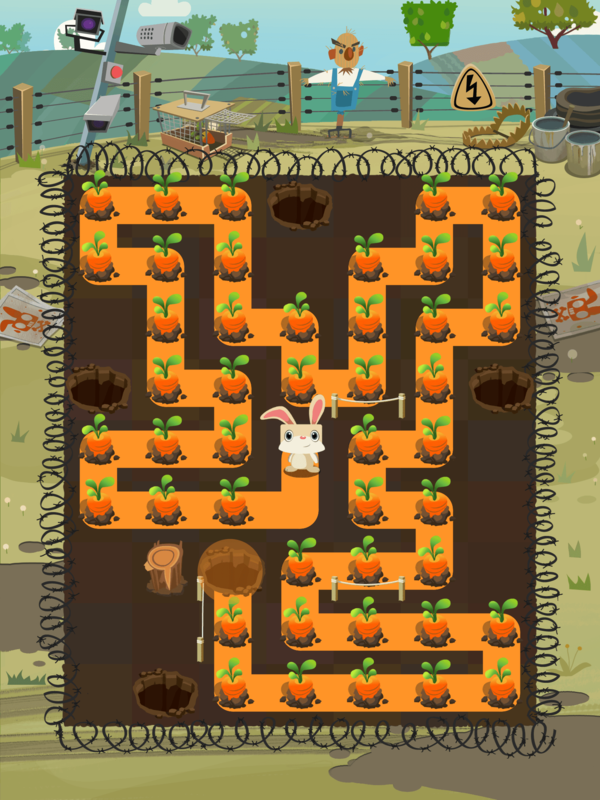 Farmer Lester has destroyed your forest home… and now it’s time for bunny revenge! 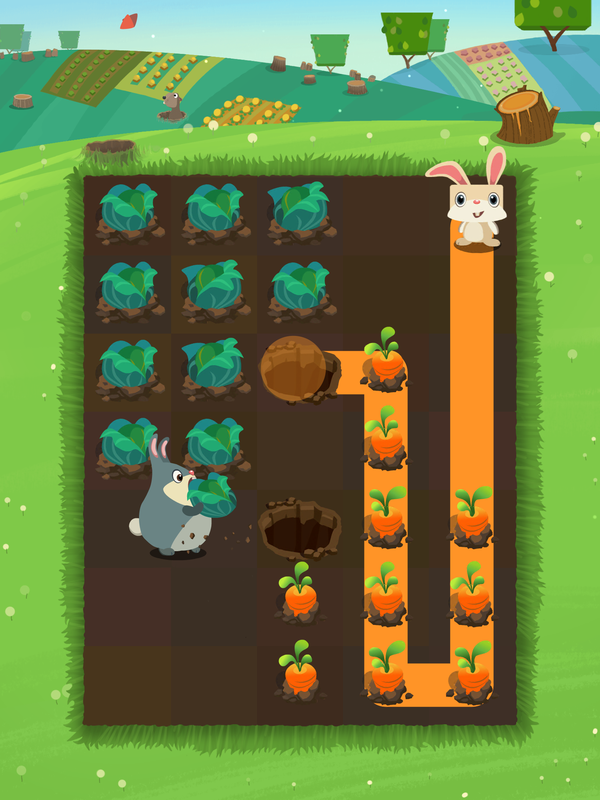 Lead a brave little bunny named Calvin, and his adorable furry friends, on a rampage through Pitchfork Farms. Devour Farmer Lester’s crops, and put him out of business by drawing paths with your finger through his carefully planted vegetable patches. 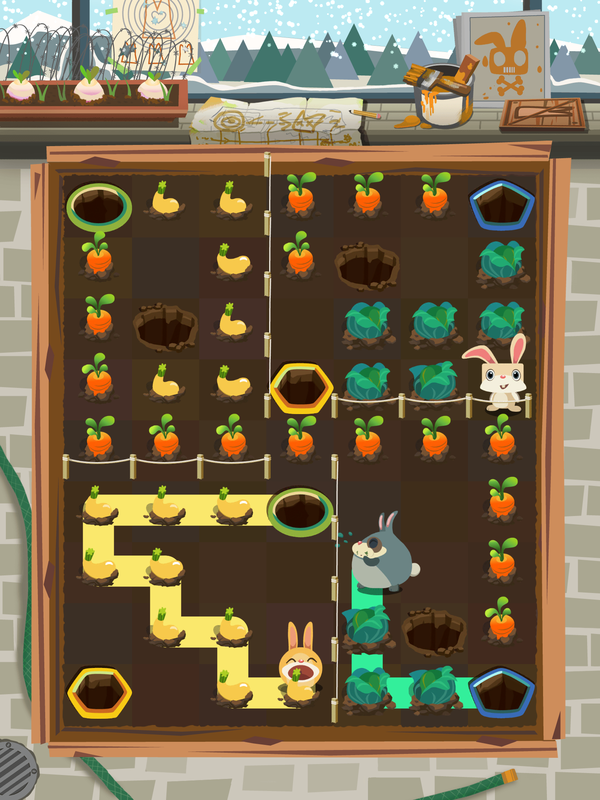 Keep your bunnies chomping away and eat all of Lester’s vegetables to get the highest score! 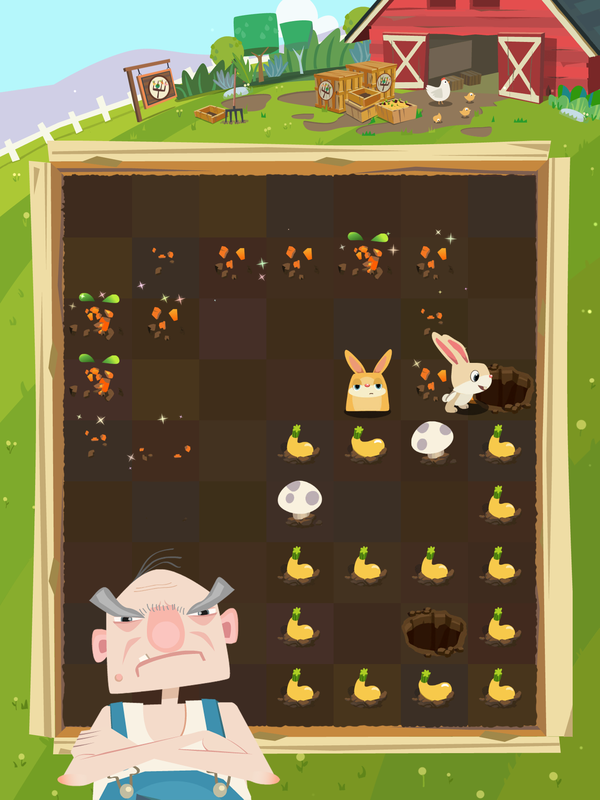 As players progress through Pitchfork Farms, they'll be challenged by hundreds of original puzzles that require out-of-the-box thinking to outwit Farmer Lester! 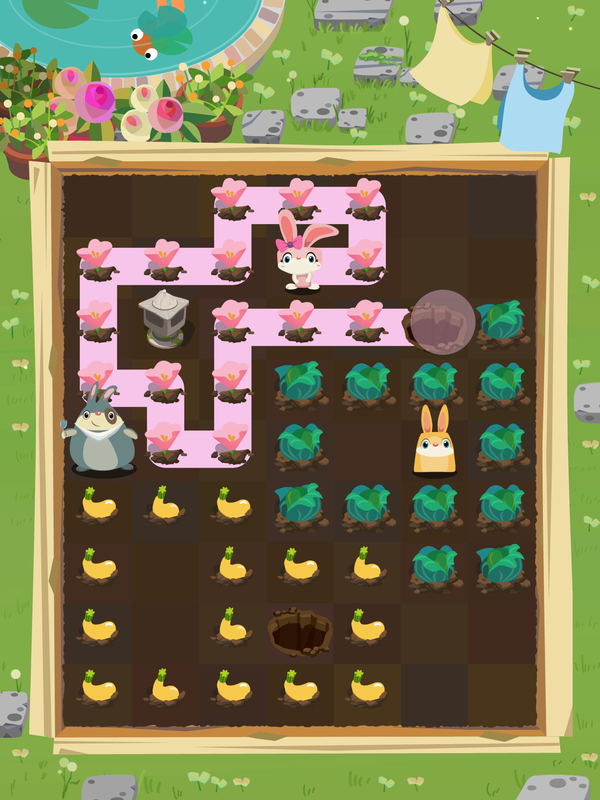 Players gradually acquire new playable bunny characters, and encounter new food types and puzzle mechanics along the way. 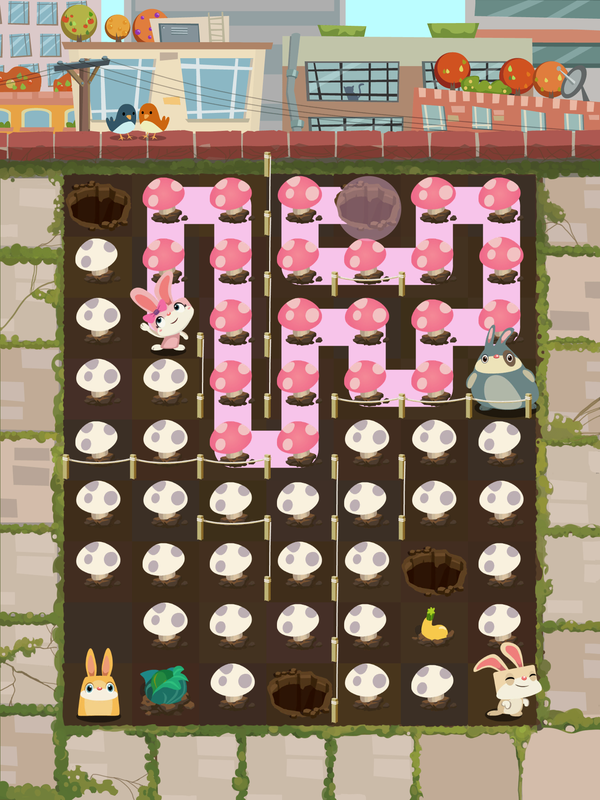 Before long players will discover mushroom levels that require cooperation between multiple bunnies, and rabbit tunnels that add a whole new dimension to the puzzles! Easy path drawing controls, and a gradual difficulty progression, make Patchmania fun for anyone to pick up and play. Patchmania launched in March 2015, has been featured on the iTunes App Store in “Best New Games,” “Best of March,” “Exclusively on iOS,” and reached the #1 spot in both the Puzzle and Board Game categories. To date, Patchmania has been played by millions of people worldwide, and is available in 13 languages. What is special about Patchmania? Patchmania features almost a thousand addictive puzzles, a distinctive art style, and an original animated story. The adorable characters and animations, simple & fun path drawing controls, and high level of polish help Patchmania stand out from the crowd. 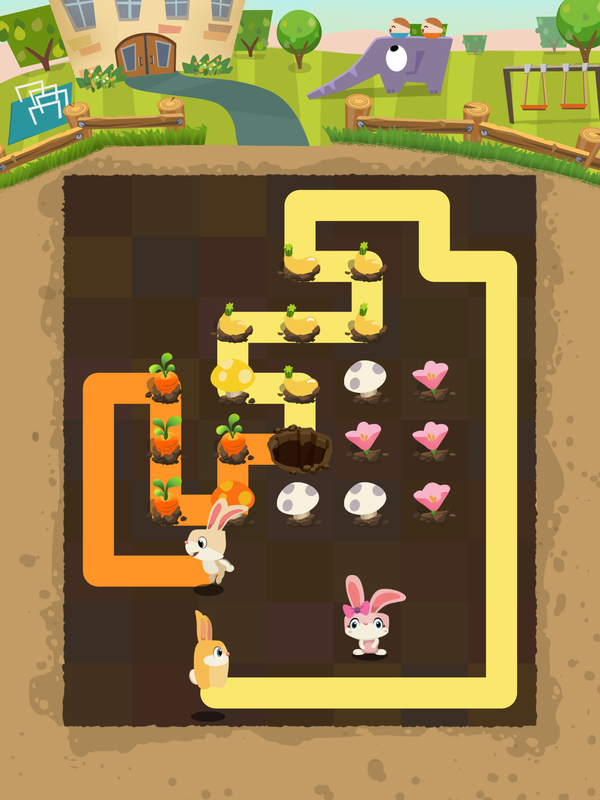 Patchmania is aimed at a wide audience of casual puzzle game fans of all ages. What do I need to play Patchmania? Patchmania is a universal iOS app that will run on any Apple mobile device (iPhone, iPad, etc.) that is running iOS 9.3 or later. Little Details LLC is a tiny app company made up of game industry and startup veterans. We're 100% indie and bootstrapped. Our geographically dispersed team is primarily based in New Jersey, but we also have team members in Ohio, Massachusetts, and the UK! See below for the full story behind our company. A full list of game credits is included in the game itself. How does Patchmania make money? Patchmania is free to download on the iTunes App Store, and players can play the entire campaign (hundreds of puzzles!) without having to buy anything. However, we also offer in-app purchases for puzzle hints, refilling lives, and unlocking level packs. For current pricing of the in-app purchases it's best to check directly with the App Store for your country. The newest version of Patchmania also features opt-in rewarded video ads that let players earn free hints & extra lives! Finally, for players who have played the game for a while for free, Patchmania will occasionally show unobtrusive and family-friendly banner ads. What are your future plans for Patchmania? Our top priority is to continue to provide additional content to our players in the form of new puzzle level packs and features. We also plan to expand the game’s reach globally by translating Patchmania into many languages (we currently support 13 languages). Beyond that, we’ll have to wait and see! Will Patchmania be available on Android? At the moment Patchmania is exclusive to iOS. If there’s enough demand, we’ll of course consider other platforms. What is the official name of the game? Little Details was founded by Jon Grall in 2012 almost by accident, after a string of startup failures. The company's first product, an iOS app called Just Landed®, was an unexpected success and became a #1 paid travel app on the iTunes App Store. After turning down acquisition offers from well-known travel companies, Jon decided to take the company in a new direction. It had been 5 years since he left a disappointing career at Electronic Arts, and Jon felt it was time to return to games – this time on his own terms, as an indie developer. 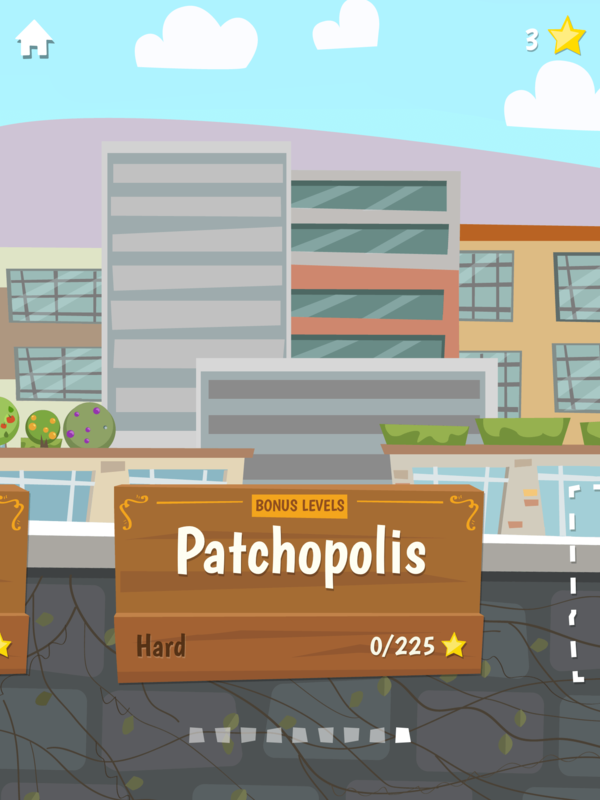 When work began on Patchmania, Jon had never built a game on iOS, and didn't have a team or even a real office – development began from a desk in his kitchen. Jon knew he wanted the company's first mobile game to feature the same level of care and attention to detail that he'd put into Just Landed, at the same time as offering something new and delightful. He began by building prototypes around a simple path drawing mechanic. 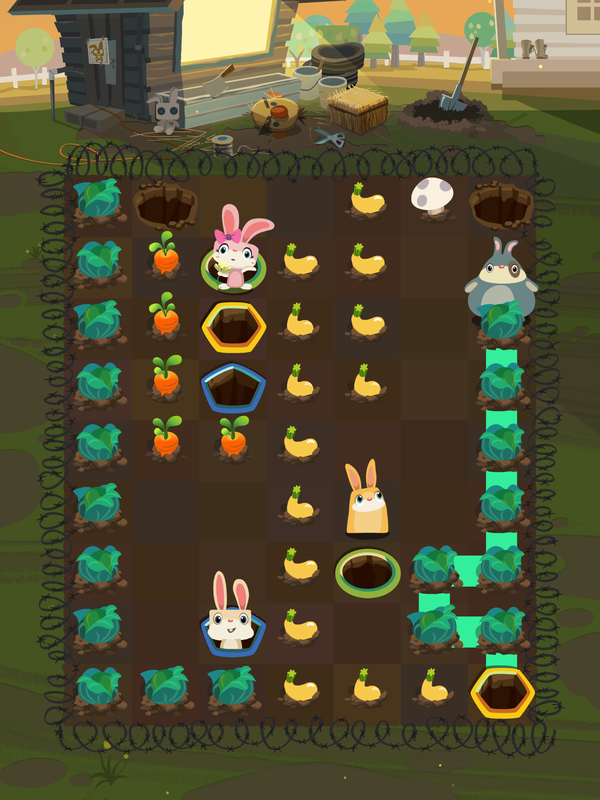 This gradually evolved into an original puzzle where the player moved little animated bunnies around a grid collecting food. For months Jon play tested the game with members of the public at coffee shops and college campuses around the San Francisco Bay Area, and even at the California DMV! Many iterations helped to perfect the game’s controls, and refine the puzzle into something with broad appeal and enough depth to be challenging for even the best players. In the summer of 2013, Jon reached out to Glenn Iba – a puzzle expert, author, and fellow MIT alum. After months of collaborating remotely on the puzzle design as an advisor, Glenn became the second member of the team, and led the development of hundreds of new puzzles. Once the game design had been finalized, Little Details hired Bonnie Lui, a talented artist who took a huge chance on the project after turning down great offers from well-known entertainment companies. 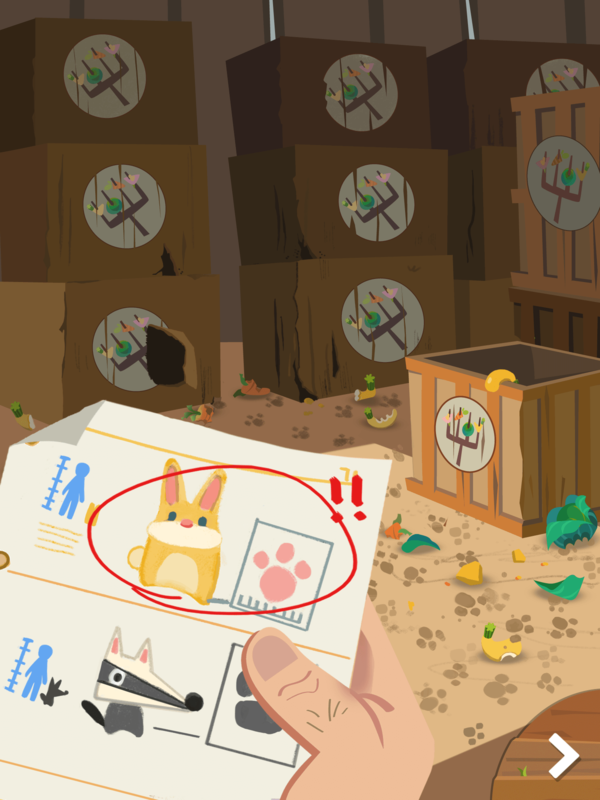 As the Art Director, Bonnie created Patchmania's distinctive art style and cast of lovable characters, and transformed the project from an ugly prototype into a real game. The team grew organically from there as they figured out who else was needed, and Patchmania began to take shape. Patchmania took 2 years to develop, and remains 100% indie and bootstrapped, with the core team members working solely for profit share. Despite a tiny budget, and a geographically dispersed team, Little Details managed to attract an impressive group of game industry and startup veterans, who all took a chance on this unlikely project. 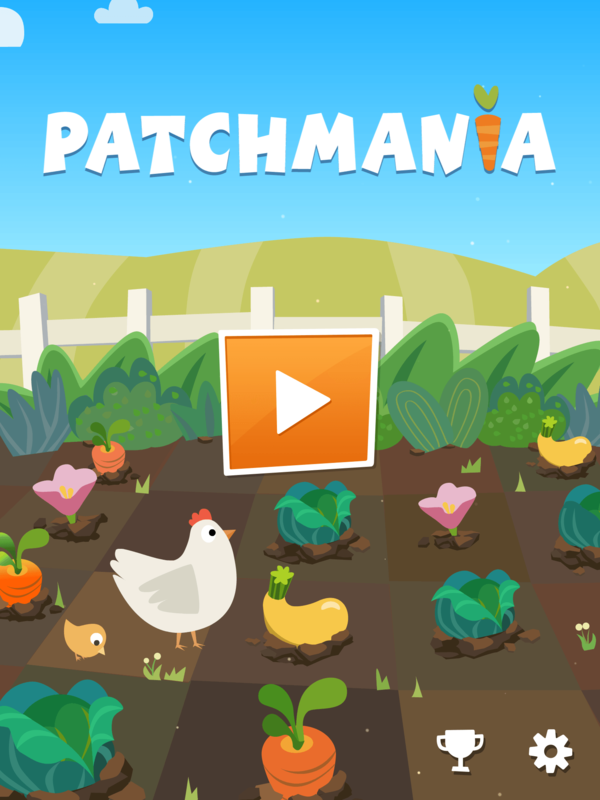 Patchmania launched for iOS on March 19, 2015, and you can download it for free on the iTunes App Store. © Patchmania. Little Details LLC. All Rights Reserved.